Ilmiliekki Quartet, a group of four hugely talented young Finnish jazz musicians, including trumpeter Verneri Pohjola, pianist Tuomo Prättälä, bassist Antti Lötjönen and drummer Olavi Louhivuori, debuted on TUM Records in 2003 with March of the Alpha Males (TUM CD 005). 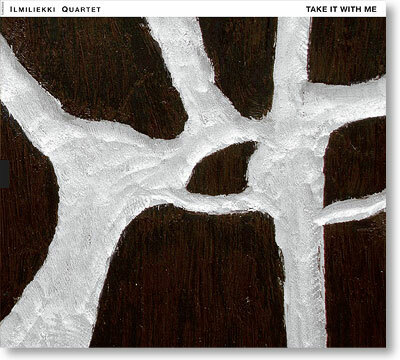 Take It With Me, Ilmiliekki Quartet´s second recording combines the potent compositional skills found within the ensemble with a knack for also exploring new ground through surprising selections of borrowed material. Each of the quartet´s members has in the past decade become a leader in their own right but Ilmiliekki Quartet continues to represent them at their most adventurous. Where the compositions on their debut presented a fairly set frame for the quartet´s performances, the tracks on Take It With Me act as more of a launching pad for the unexpected. This is contemporary free improvisation, with always a strong presence of melody, of the highest order.